What is one to do on a wet miserable day? Clean out the fridge and freezer sounds like a good job to get done and I can clean out all the leftovers and get rid of them. It did not take long to get everything cleaned, but what to do with a bit of leftover mashed potato, 2 rashers of bacon, a scrap of cheese and half an onion? 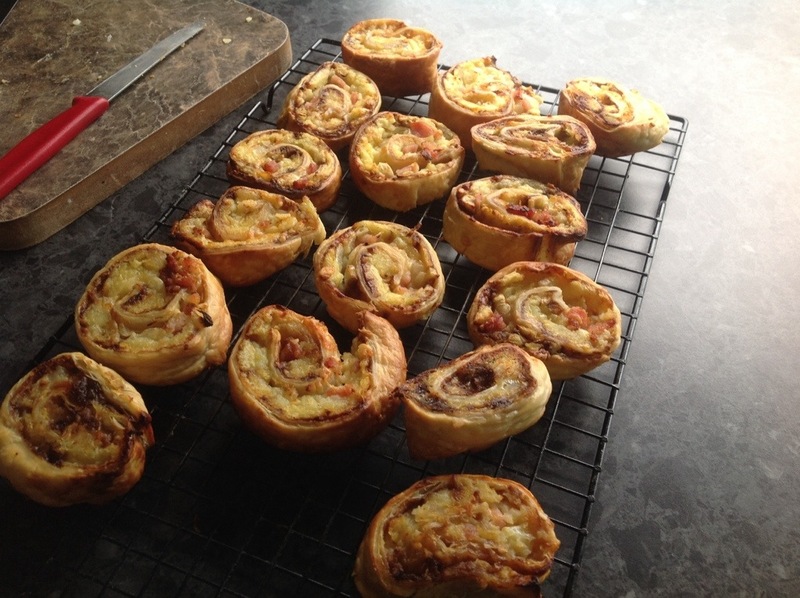 Oh, I know what I can make, and as well I can use up the three sheets of puff pastry languishing in the freezer, savoury pinwheels – a real blast from the past! 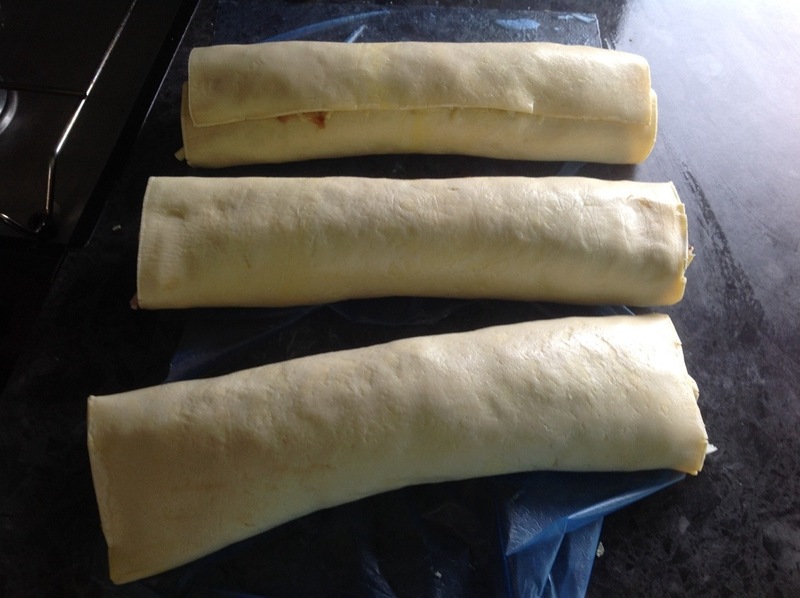 For those of you who are not aware of these delights, which I am sure is a recipe from my primary school cooking classes days, I will take you through the methodology step by step. 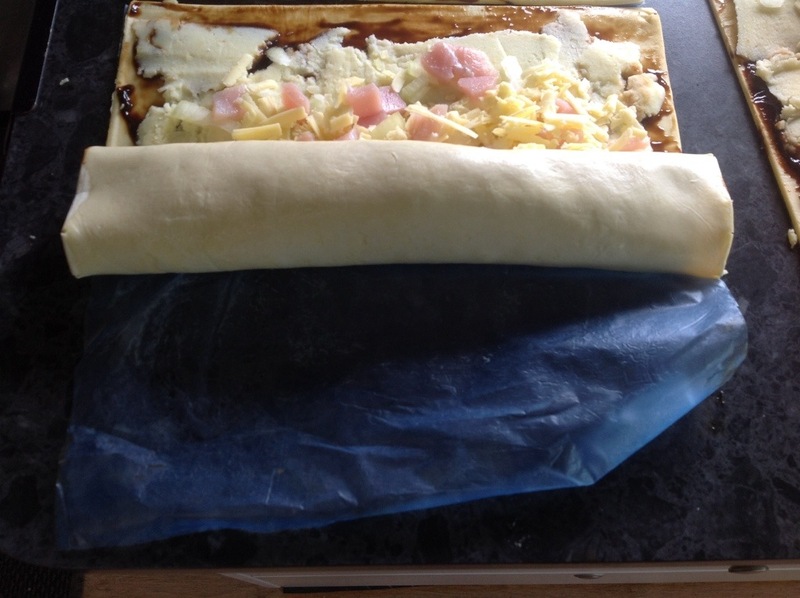 First remove the pastry from the freezer and separate the sheets, spread the pastry sheets with either Vegemite or Marmite. In our household, the females eat Vegemite and the blokes are Marmite fans, but as I am the one making them, I get to choose :). 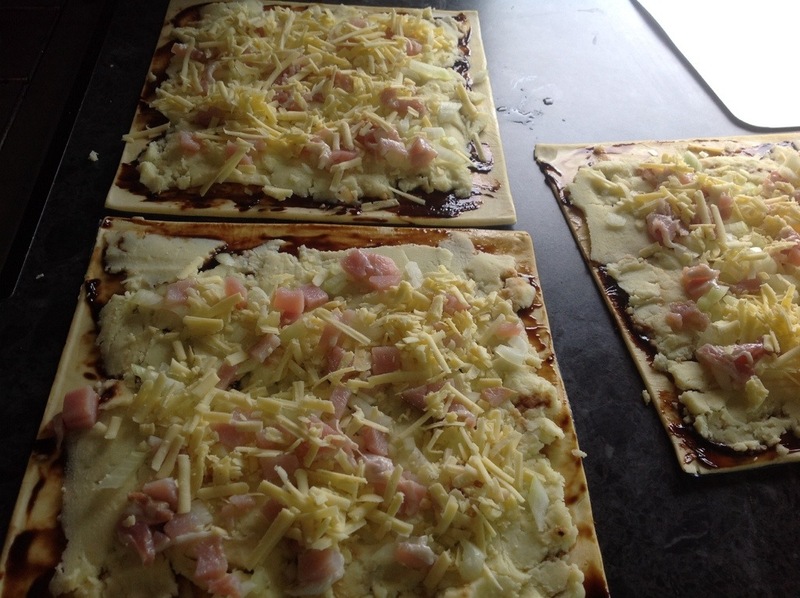 Then place a thin layer of mashed spud on top, sprinkle with chopped bacon, onion and a little grated cheese. 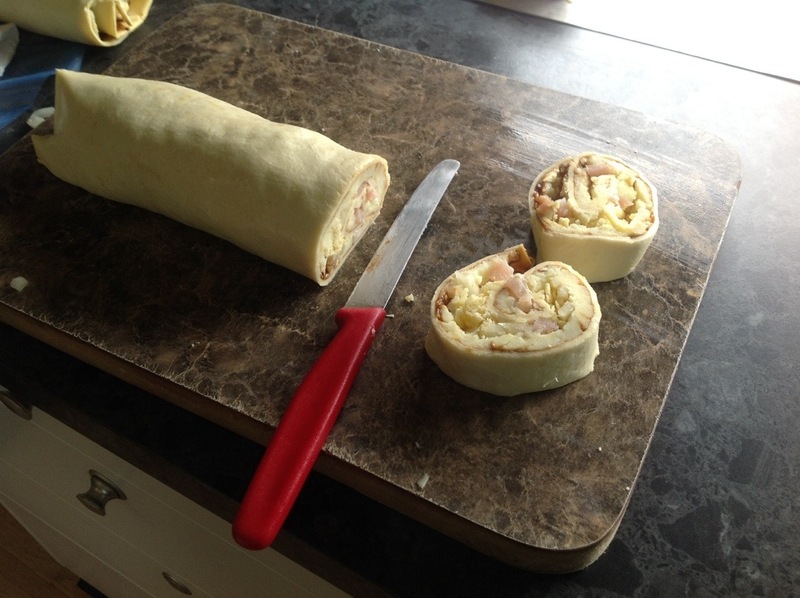 Next, carefully roll up the pastry, making sure that the plastic sheet stays out of the mix! Then place on baking trays. Have your oven heated to 220C and bake until nicely browned and cooked through. 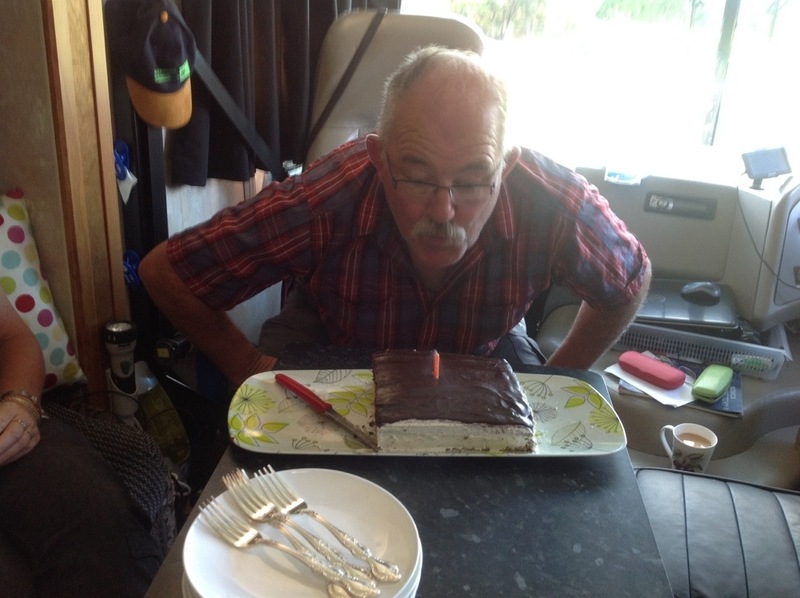 The following instructions are for cooking in a Motorhome oven which is gas powered. I use a large ceramic tile in my oven which I place on the rack so that it acts similar to a pizza stone. 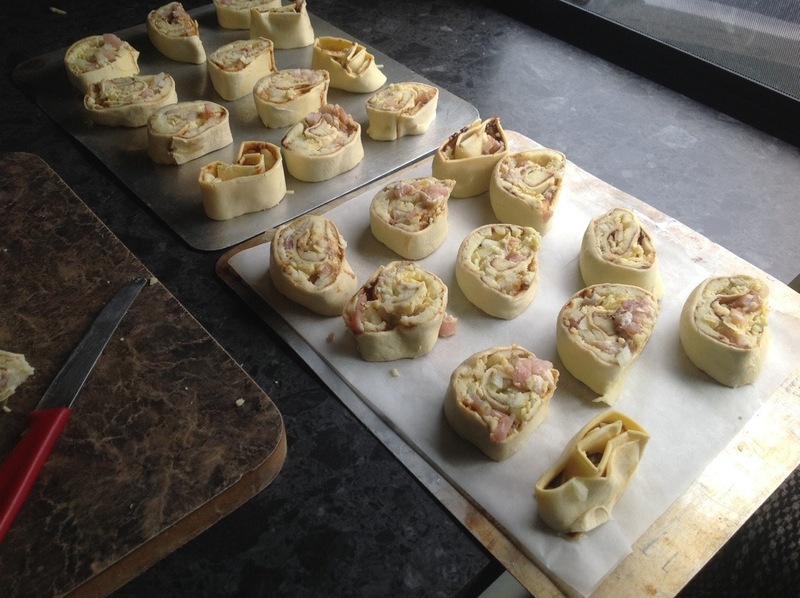 Place the rack on the top shelf in the oven, once heated, cook the pastries, turning the tray half way through the cooking time and if necessary turn the pastries over as well. There is a market every Saturday morning in Thames, so it seemed a good opportunity to go and check it out particularly as it is Easter Saturday it may mean that there will be a lot more people there. So we headed off stopping in Kopu along the way to pick up Pat & Sue. The Thames market is a little different to any other market we have been to, as this one is set up along part of the Main Street with stalls set up outside shops. You would think that the shopkeepers would not be happy with stalls set up on their doorsteps however, it seems to work really well with lots of people checking out stalls and then wandering into the shops and cafés. There was an abundance of farmers selling their wares, everything from Olive Oil, to fruit and veg, to bacon, salamis and other meat goods with the mussel fritter stall proving to be very popular with a queue snaking along the street. There were handcrafts, bric a brac, tat and all sorts of stalls selling their wares as well as a good variety of buskers adding to the atmosphere. The shops were doing a great trade as well and the place was really buzzing with a good crowd of people in the town. Of course I had forgotten to take along a camera so you will have to take my word for it that the town was very busy and alive with activity. I popped into a knitting shop to see if there was anything I may need and came out with a bargain! yes folks, a sewing machine!! 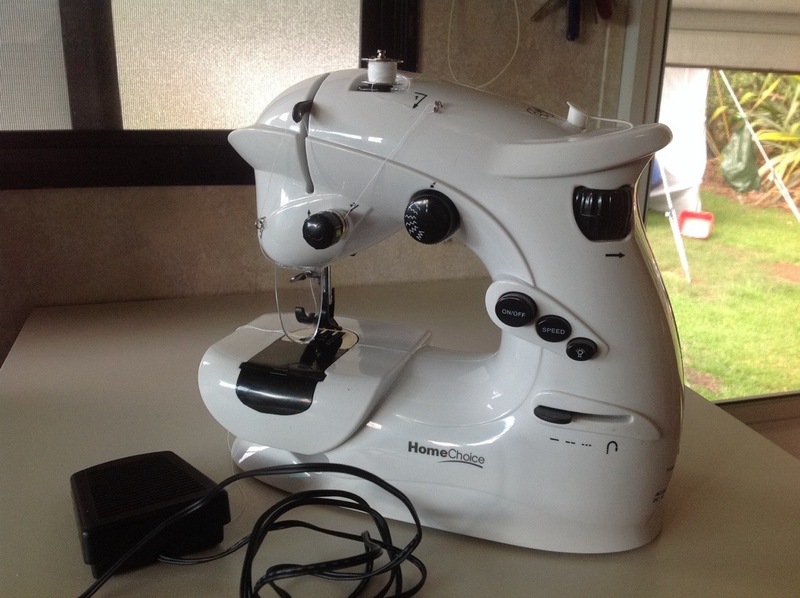 Our granddaughter Rose was the beneficiary of the previous sewing machine I bought, but this one was too much of a bargain to let it go. This one has a choice of 7 stitch variations to choose from, including zig zag, it works exceptionally well and at just $25, a real bargain! We also wandered into one of the very busy cafés for a coffee, in fact it was so busy that we were told that the waiting time for our coffees would be around 20 minutes! It was well worth the wait though, with a lovely coffee and a bite to eat to accompany it. Behind the cafe was a deli selling all sorts of delicious goodies, and yes we came away with some delights. With our bags ladened with fresh fruit, veg, eggs and other goodies, we bade farewell to Pat & Sue and headed off back to Waharau. By late afternoon the heavens opened and for the past 24hrs we have had heavy downpours of rain interspersed with periods of sunshine. Although, we reckon we are becoming accustomed to the warmer northern climes as we were both complaining how cold it got last night……..the temperature had dropped to a chilly 16C! We left Whangamata on Wednesday, we waited for a bit of a break in the rain so that we could mow the lawns and tidy the garden, a novelty experience for us these days, but with that done, we packed up heading first for Kopu. Sue & Pat are holed up in Kopu having some repairs and maintenance work done on their vehicle. They have both been seconded as apprentices doing a lot of the donkey work themselves whilst living in their van in the workshop. It will all be good once it’s done, and it will be better than new. We caught up with them before heading off toward Waharau. 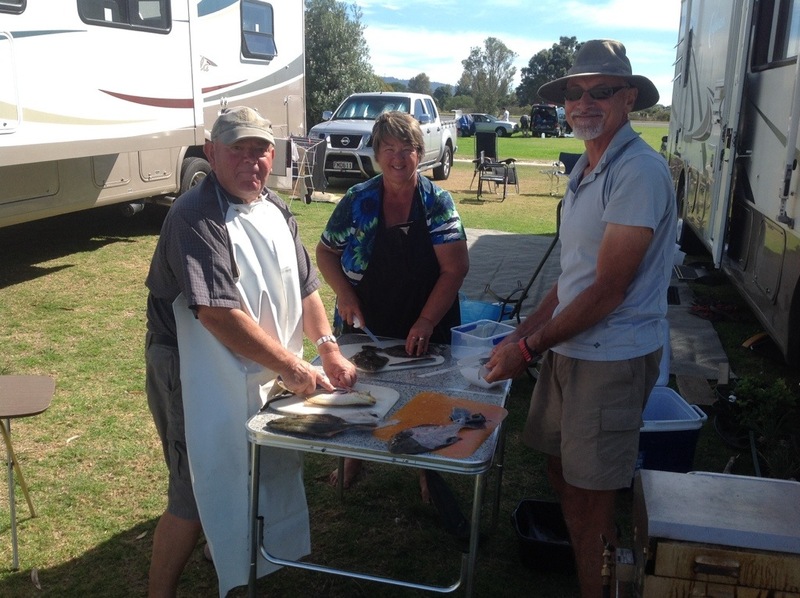 With the weather supposedly deteriorating over the next few days with strong winds and heavy rain forecast, we drove past the few brave souls parked up on the shellbank at Ray’s Rest, and a few more parked up at the boat club in Kaiaua, heading straight for Waharau Regional Park. 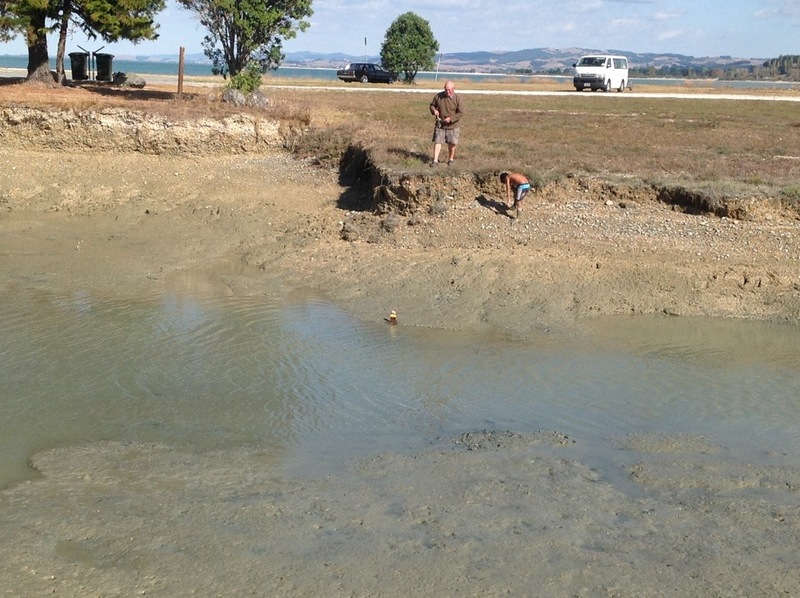 We booked in, tentatively requesting a booking for the Tainui camp as we presumed it would be booked out over Easter, but no, we can stay there as apparently a number of people have cancelled their bookings. So here we are parked up, hooked up to power, with flush loos, seriously good pressure hot showers, and sinks for doing dishes. 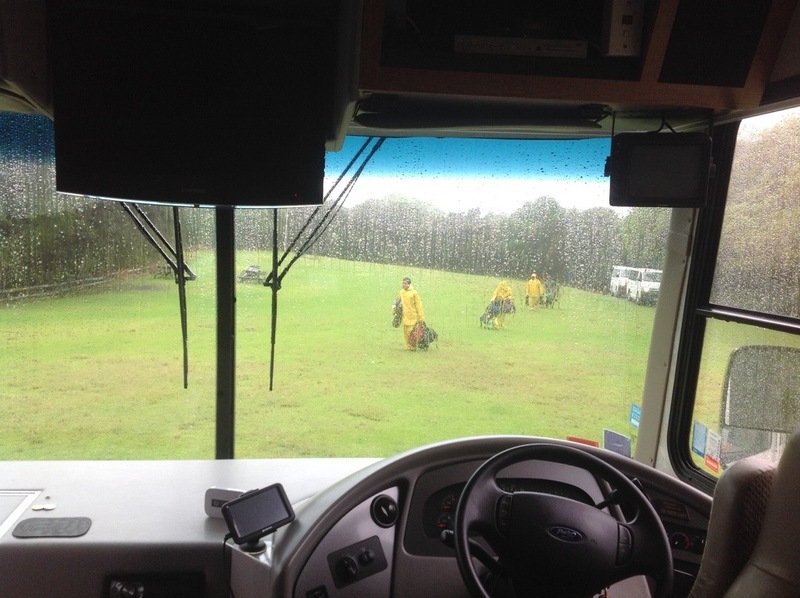 And yes, overnight the weather did pack in, however, we are parked up next to the ablution block which is affording us good shelter from the prevailing winds and yes, it is very wet but we are cosy and dry in the van. 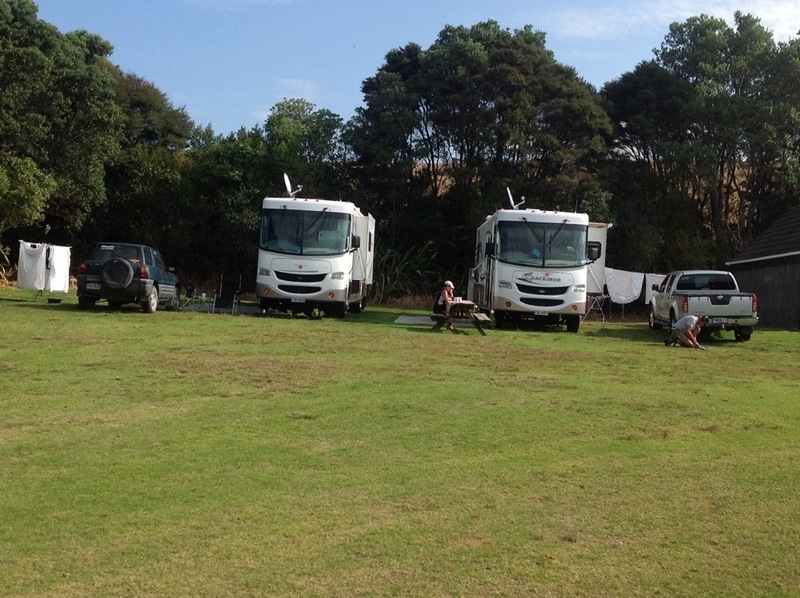 Unlike these poor souls would who have turned up today, complete with backpacks and tents ready for a weekend camp! Apparently they are on a course which challenges them, and this is part of their challenge! Well, there are major challenges in life but we do not have to be silly about them, we can make informed choices like take note of weather forecasts….or am I just getting old(er) and like my creature comforts too much? It seems like they are well organised and set up so hopefully they will not be challenged too much. 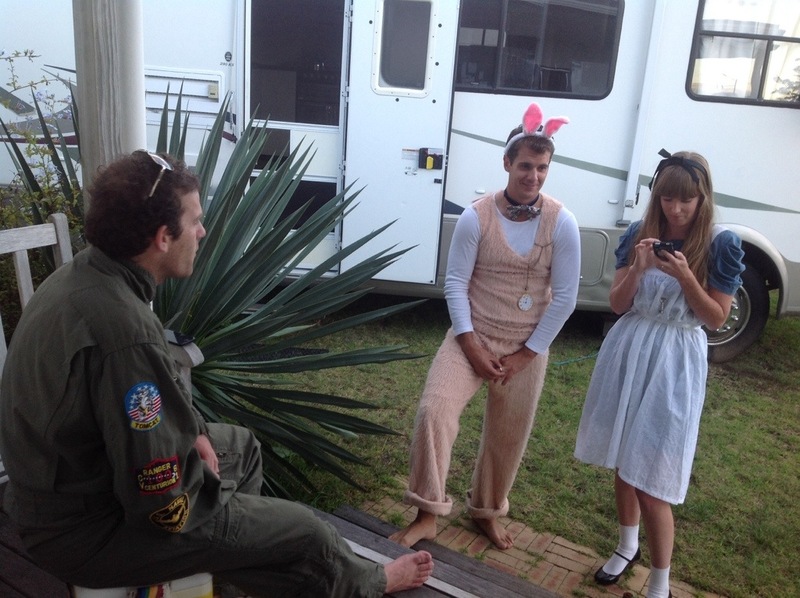 Maverick (Top Gun) with the White Rabbit and Alice. and a few more of us! The weather stayed fine and warm, with most heading off for a swim at the beach on Sunday morning. Roy and I spent the weekend making sure everyone was well fed and watered, which we did in our usual manner. I have to admit that these fit types sure do manage to put away the food!!! 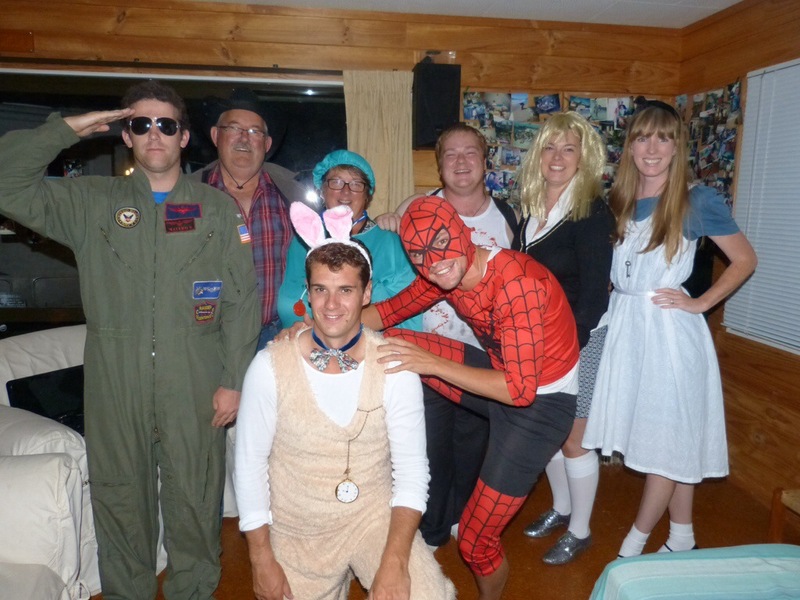 We played all sorts of games, ran a quiz and generally had lots of fun…..what goes on at the party , stays at the party!! By late Sunday afternoon everyone had left and we were back to just the two of us. A bit of a clean up and tidy up to follow but I have to say that there was little to do except change beds and do the washing as they all pitched in and had everything tidied by the time brunch was over on Sunday morning. A fabulous weekend all in all, surrounded by a great group of talented, friendly and all round welcoming young people. They included a couple of PE teachers, a couple of Olympic Rowers, a High performance Triathlete coach, Police staff, and more. We feel privileged to have been able to be part of their weekend of fun. Happy Birthday Antony, we are very proud of you. The flounder have been running straight into our net over the past few days or so it seems; 13 one day, 17 the next and 22 yesterday, plenty to fill all our freezers as well as lots of fish for dinner each night. We have been filleting the flounder so that they fit into the freezer better which is a bit of a fiddly job, but with a little practice and a very good sharp filleting knife, I have the process down to a fine art. Now the freezer is fairly full, we are hoping that today’s haul may bring a few snapper as the net has been set out further along the bay at a place where a local told us is where we are likely to catch a few snapper. Fingers crossed that it proves correct. 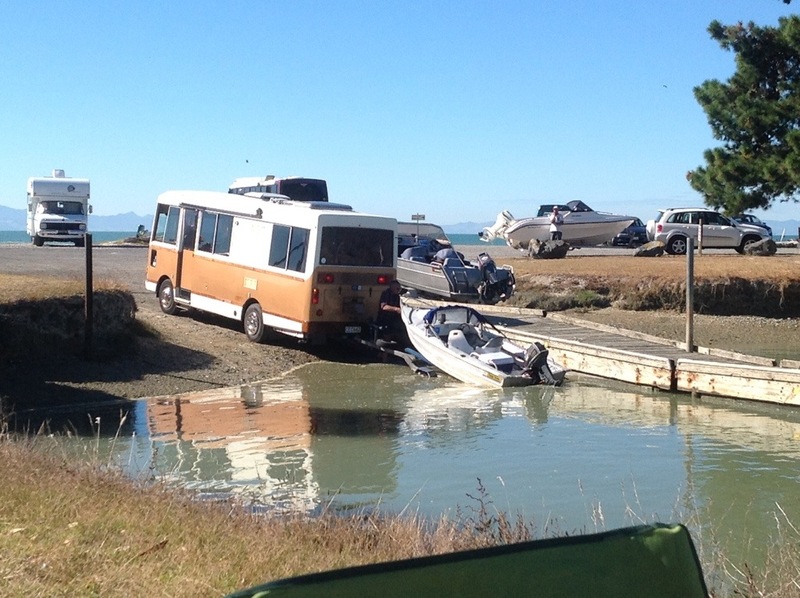 There was a Motorhome launching a boat, they were obviously well versed with launching and retrieving with their Motorhome, whereas there were others who with their front wheel drive cars who had a lot of trouble gaining traction. 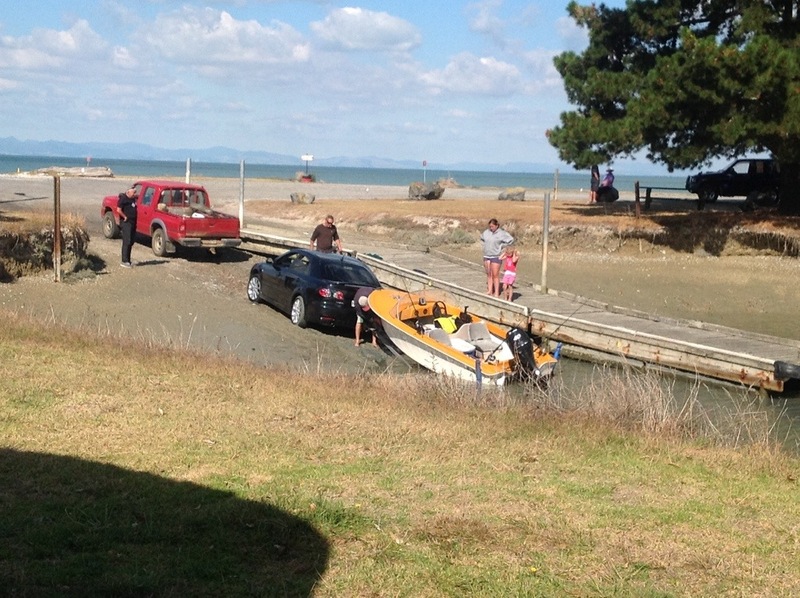 One person got their car and their trailer bogged down and had to unhitched their car so that a ute could hook up and retrieve the boat. It also took some time for the car to inch it’s way up the ramp, with much wheel spinning, smoke flying, car fish-tailing and screeching of tyres, the car eventually made it to the top of the ramp. I bet they needed new set of front tyres though. Another fisherman left it a little late to retrieve their boat from the tide with the boat and trailer sinking into the mud, the winch rope breaking under the strain of trying to pull the stern of the boat out of the mud. This resulted in the boat slipping back down the trailer into the mud, sinking deeper, with the mud almost sucking the boat into its grasp. It took the owner over an hour to free the boat and finally get it onto the trailer. I did not take any pictures of this particular effort as it seemed that he was having enough of an embarrassing situation without me taking pictures adding to his embarrassment. More entertainment was provided by a young boy who with his Dad had made a raft out of sticks, complete with small sail. The young man had many hours of pleasure chasing his boat along the shoreline, at was until a strong gust of wind toppled his boat upside down and out of his reach. Jim took pity on him, and armed with a fishing rod with a small sinker on the end of the line, he managed to hook up the boat and bring it to shore to it grateful young owner and to great applause from all who were watching from the other bank. 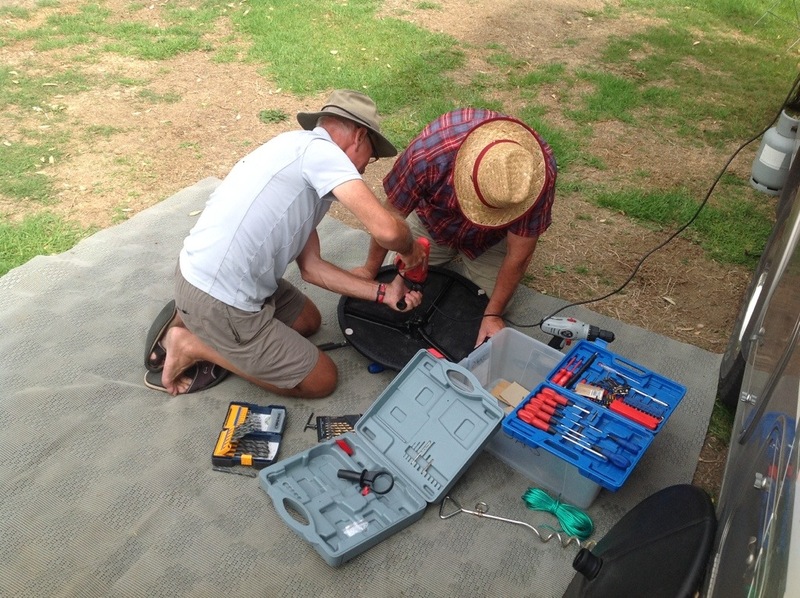 Whilst at Waharau we took the opportunity to fix a couple of things, one being my armchair. This proved to be a bit more difficult that first thought however, lo and behold, the base of Roy’s chair decided to give up the ghost at the same time. To repair the two chairs required taking the base off one chair and fixing it to the top of the other chair with the remaining bits only fit for the rubbish pile. It also required some heavy duty equipment including an angle grinder. Luckily between Pat, Jim and Roy, they had the required bits and pieces. The crux of it all, is that we now have just one chair, but luckily I have a replacement on its way as Mum had one identical, I put my hand up for it and it is in Tauranga and will picked up later this week. 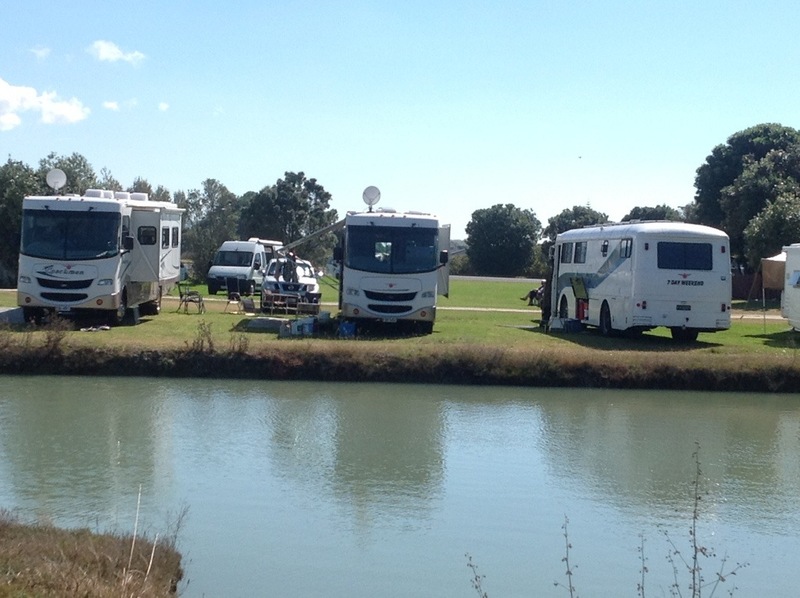 The Tainui camp at Waharau was booked out for the weekend so we headed off down the road to the Kaiaua Boat Club where they have a very nice parking area alongside the boat launching ramp. 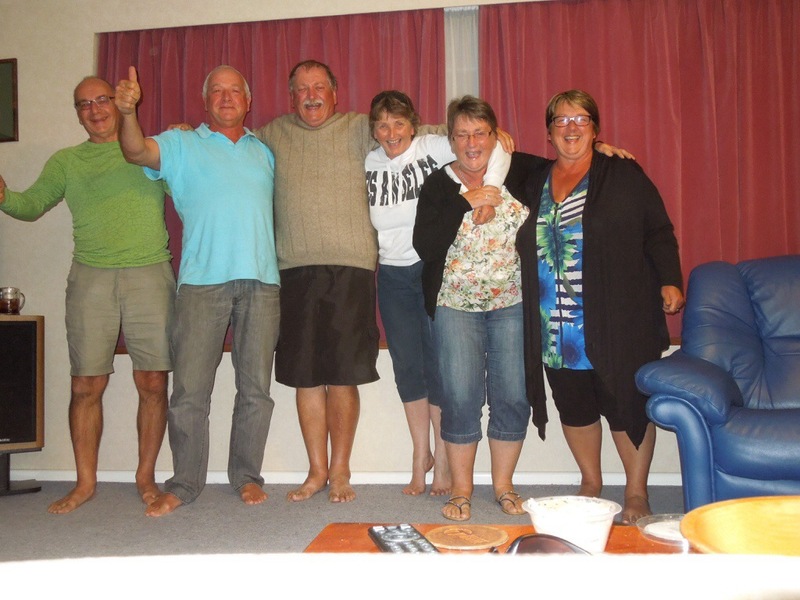 It’s not often that myself and my five siblings get together, in fact it is a pretty rare event…..even more rare when it is just the six of us with no spouses or offspring to distract our attention. It was a pretty intense few days in Oamaru that we were all together, but boy, did we ever experience the whole rollercoaster of emotions. The last couple of years have been incredibly trying at times what with one thing or another, with far too many deaths for us all to deal with. It sure makes you look at your own life carefully. Dad’s death closes another chapter in our lives. That generation of our family is now all gone and we are now the “seniors” in the family…a scary thought! We all worked very hard to get Mum & Dad’s house sorted and cleared out ready for sale. Through a Herculean effort we managed to get it all done by Wednesday, which is just as well as I flew back north on Wednesday afternoon. 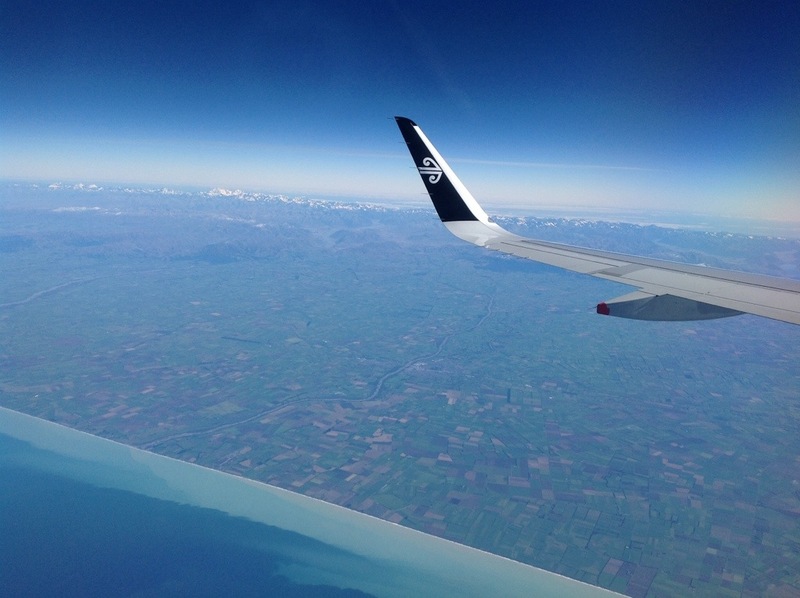 view across the Canterbury Plains across to Mt Cook in the background. We managed to take a few photos of us all together, although a number of them have been censored for family viewing only! But here we are, all having a good laugh, although I cannot for the life of me remember what had us in stitches. L to R: Mike, Steve, John, Hilary, Sue, Bernice. Now that brings me to this blog. 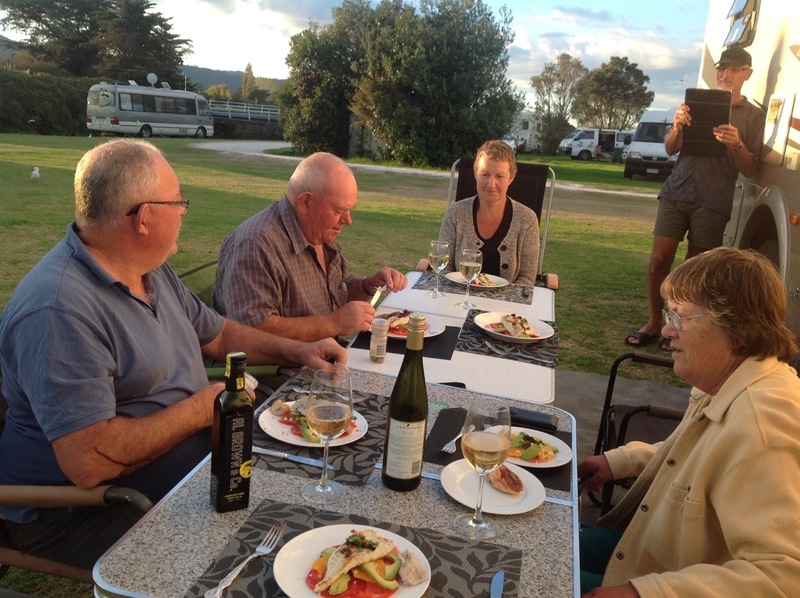 We started this blog nearly 4 years ago primarily so that Mum & Dad could follow us on our travels initially through Europe and subsequently through New Zealand. Now, do we continue with the blog? Does anyone else read the damn thing? 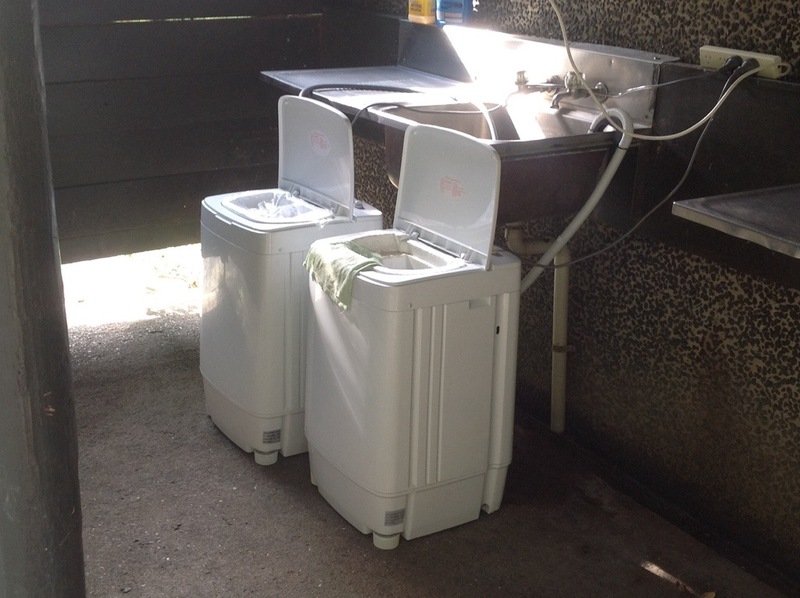 Oh, apart from John, I know he avidly follows the adventures of washing machines we use around the country! Or do we continue with infrequent postings of our travels as an online reminder of where we have been?